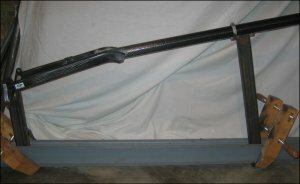 This will be my weight weenie project. Over the year I have obtained weight weenie parts, but haven't really had a bike to put them all on. 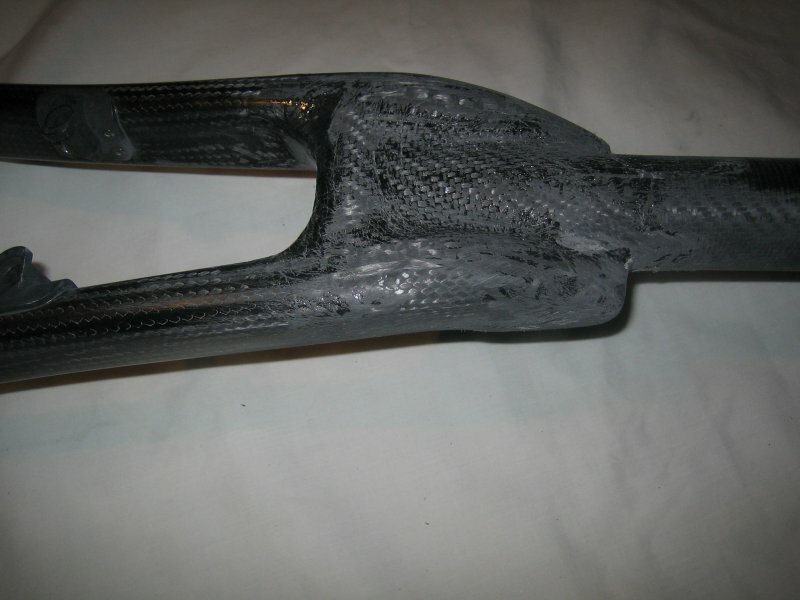 In this project I will use a straight carbon main tube, and will bond it to the carbon rear chain stays shown below. 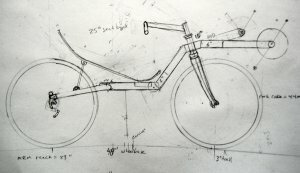 I'm hoping to end up with a bike that weighs under 20 lbs. Here is the current plan (subject to revision at whim). * Mark Anderson has a tube, which is probably a bit light. 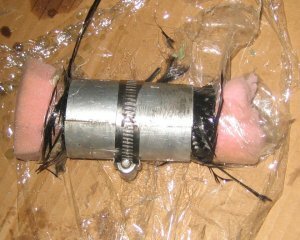 I'll wrap the tube in in Kevlar and CF to beef it up. * Lightweight Paul brake handles. I now have the main CF tube and CF head tube. The main tube is a little thinner than I would like, so I'm going wrap the tube in in Kevlar and CF to beef it up. After I join the main tube to the rear stays I may cover the whole thing with a pretty sleeve. This will also cover my joining job and the chain stays to give the bike frame it a uniform appearance. 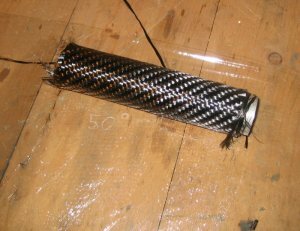 Soller also sells some large heat shrink tubing, which I may use in lieu of a vacuum bag to squish the sleeve/epoxy onto the CF main tube. 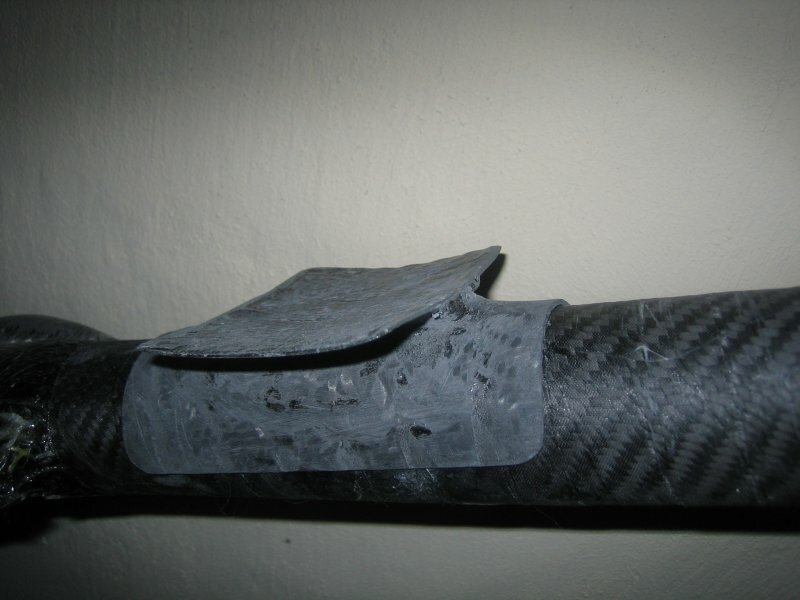 Also the heat shrink tape from Aircraft Spruce would help to provide more pressure. Mark notes: "Where as aircraft spruce only sells one kind of shrink tape, My new favorite composite supply shop is www.decomp.com They sell the best shrink tape around, the Dunstone Hi-shrink tape, in several different widths and some with release coating. Very helpful over the phone. Simply crushing power when shrunk, I don't have a way to measure it but dang, it's strong stuff. And it releases like butter." 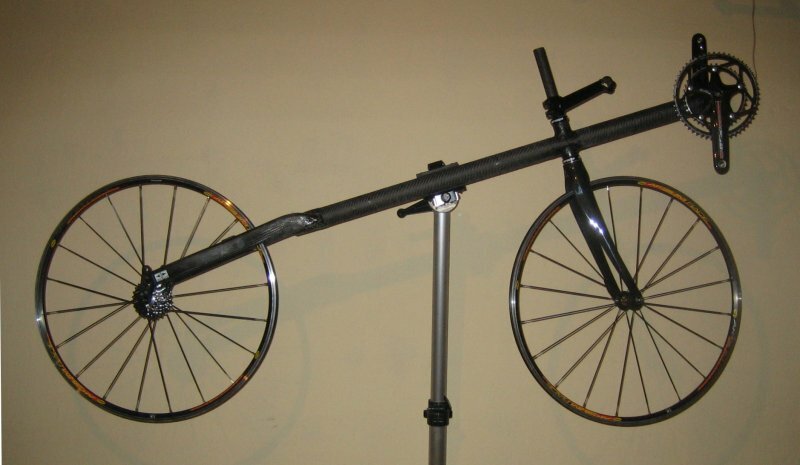 I notched the CF tube, and put the tube and the K2 rear stays in the frame jig. Mark Anderson had sent me some super-lightweight two-part filler putty, which I used to join the main tube to the rear stays. It's cool stuff. It starts out kind of powdery but ends up doughy after kneading it for a while. After this cures, I'll trim the leading edge of the seat stays until they look right, and then start covering the mess with CF. I decided not to use the 24" front fork and wheel, opting instead for two wheels the same size. Before arriving at the final frame geometry and starting the cutting, I needed to figure out what wheels and fork I would use. 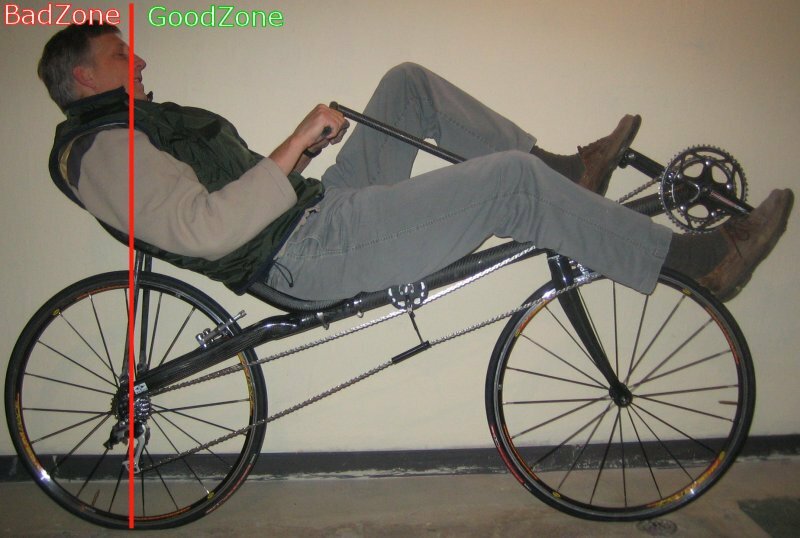 I want this bike to have the same riding position as the NoCom, which has a 9" seat to BB height differential, to make the transition painless. This means I may have to cut the main tube a angle the boom tube down a bit. 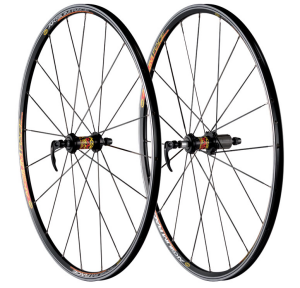 After much contemplation, I purchased a set of Mavic Aksium 700C wheels from Ebay for $200. Not the lightest wheels at a weigh of 870g front and 985g rear (1855g per pair), but a lighter set would have been the big bucks, and these had good reviews. After losing a couple Ebay bids for Easton C90 CF forks, which were nice and light weight, and matched the rear triangle (also made by Easton), I bought this 335g no-name CF fork from China. It was about $90 with shipping. 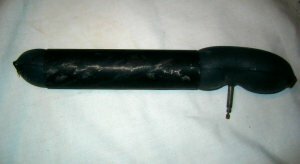 Headtube: 90° to main tube. I bought some CF tubes from Mark to use for the handlebars. 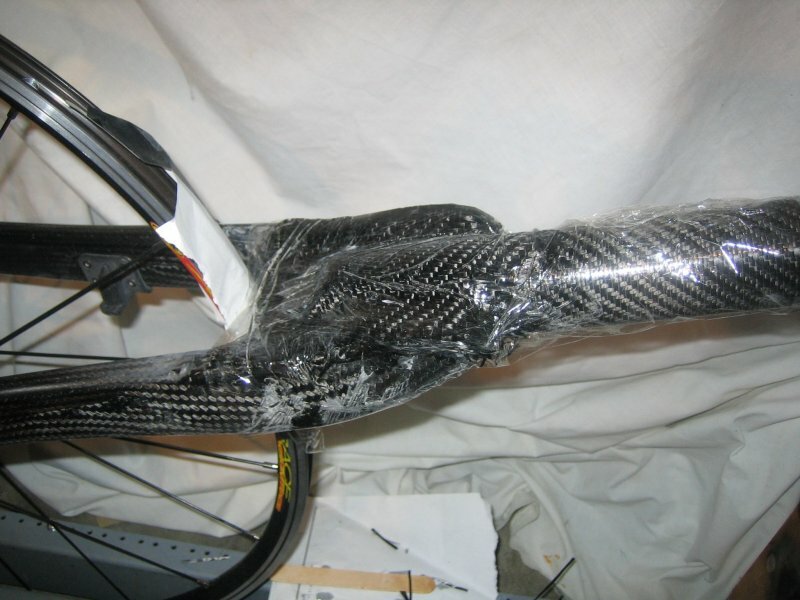 Mark also notes that the Elan team uses peel ply tape to wrap their bike frames. 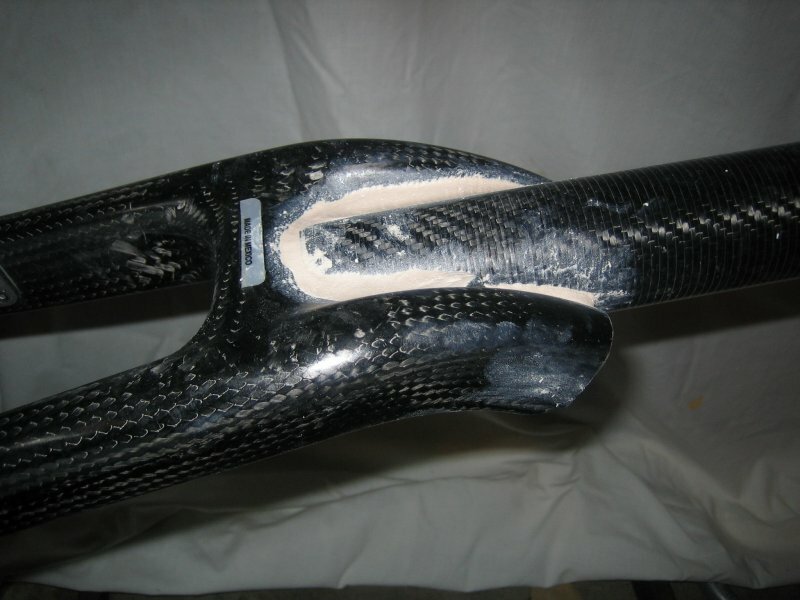 The tape can be wrapped tightly to compress the layup, and the excess epoxy weeps through the material. After curing the tape is removed. This sounds like the perfect solution to me, plus it's cheap, which is a good thing. It's available at Aircraft Spruce. 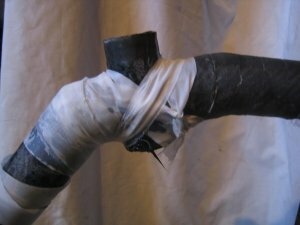 This weekend I CFed the rear stays to the main tube using the "cover in plastic wrap and smash together with foam" method. Here several layers of CF were wetted out with epoxy and then covered in plastic wrap. With the clear plastic over the layup it is easy to press the layup into the frame and squeegee out any bubbles. I then added a chunk of dense foam and wrapped it tightly. The foam presses the layup into the part and fills the voids. Here, the frame keeps warm on my old hot-water furnace to help it cure quickly. Next, the main tube will be reinforced with 1 layer of Kevlar tube, and then a layer of CF fabric. This will be wetted out and then wrapped with the peel ply tape noted above. Meanwhile, several days later, the part is all cured. I sanded off the excess epoxy that was pressed out the sides of the plastic wrap. Also the wrinkles in the plastic leave fine epoxy ridges that needed to be sanded off. Both the top and bottom look good, and all the CF was pressed tightly into the part. 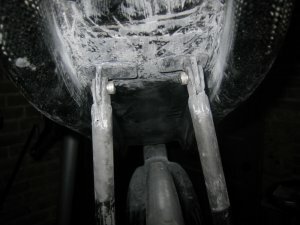 A note on sanding CF - Because CF dust is not good to breath, be sure to wear a quality particulate filter mask and do the sanding outside of your living area. I need to make the inside diameter of the CF head tube a bit smaller to fit the 1 1/8" headset. This means I need to form a layup of CF to the inside of the head tube. 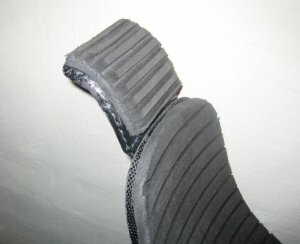 I hacked up a inner tube to use as a bladder to push a layer of CF tightly and evenly against the inside. A standard 1 1/8" head tube has an ID of 33.8mm. This tube has an ID of 38.7mm. It needs to be 4.9mm smaller ID. The CF I have is about .05mm thick, so that means I need another 5 layers on the inside. I rough sanded the main tube to allow good bonding, then slid on the Kevlar sleeve. I spiral wound some thin Kevlar thread around the sleeve to hold it in place for wetting out. The single layer of CF has been cut. 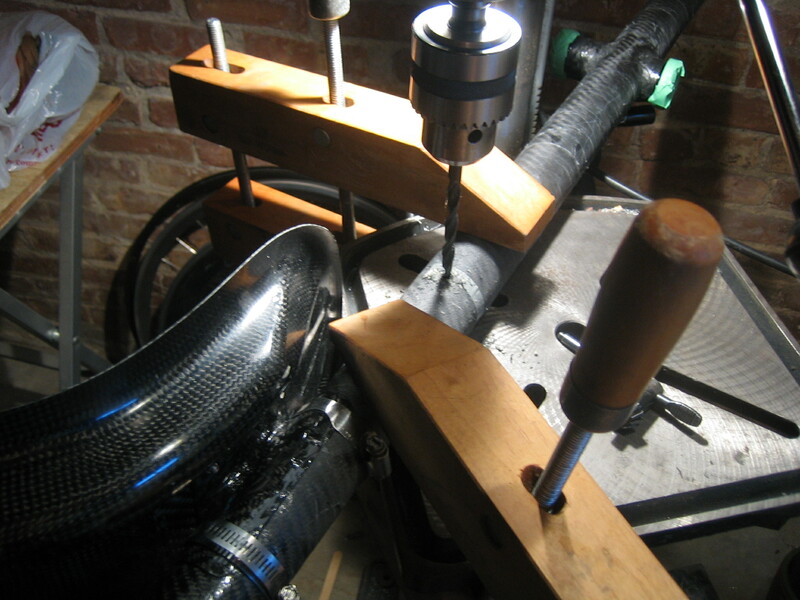 Mark A. is sending the peel-ply tape, so hopefully next weekend I can do the final layup on the main tube. 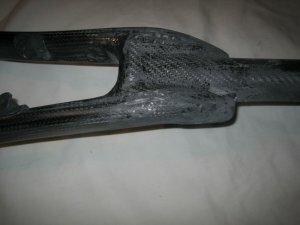 The Kevlar and CF will overlap the rear stay area to provide a strong transition. This will be a high stress area. I received the fork from China. It looks good and is very light. 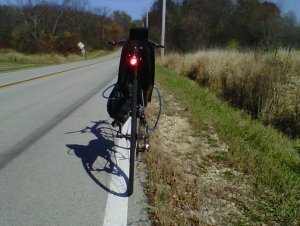 Also ordered the headset and some other small parts from icyclesusa.com. Mark is sending some peel ply tape. 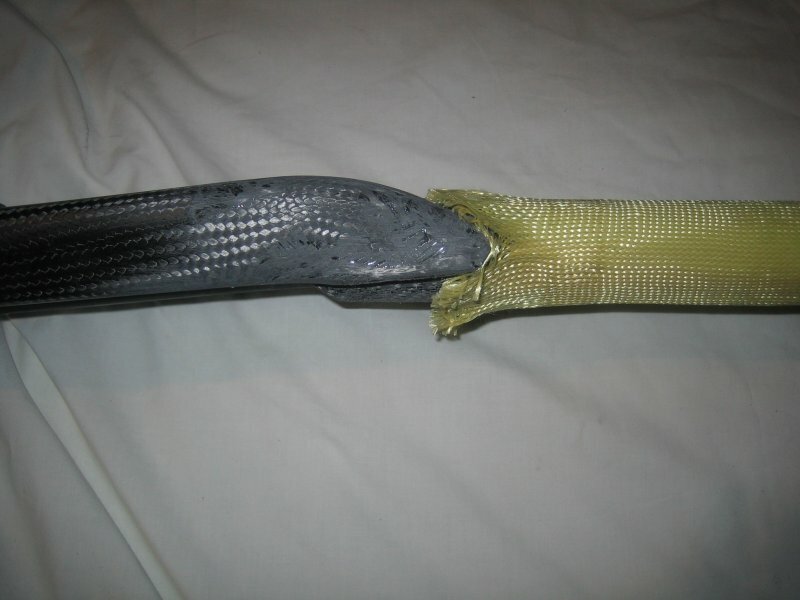 I reinforced the main tube with a layer of Kevlar and a layer of CF, and wrapped it up with the peel ply tape. It worked great. With the peel ply tape I could tell where the layup was not quite wetted out enough and then add a bit more resin. The excess resin went right through the tape. I peeled the peel ply off before the resin fully cured at it came off pretty easily. Some strings from the peel ply tape were still embedded in the layup as the edges of the peel ply tape frayed a lot during application, but I should be able to remove them with a little time. I also used the bladder I made a couple weeks ago to add CF to the inside of one end of the head tube. I'm still waiting for that to cure so I'm not sure how it worked yet. 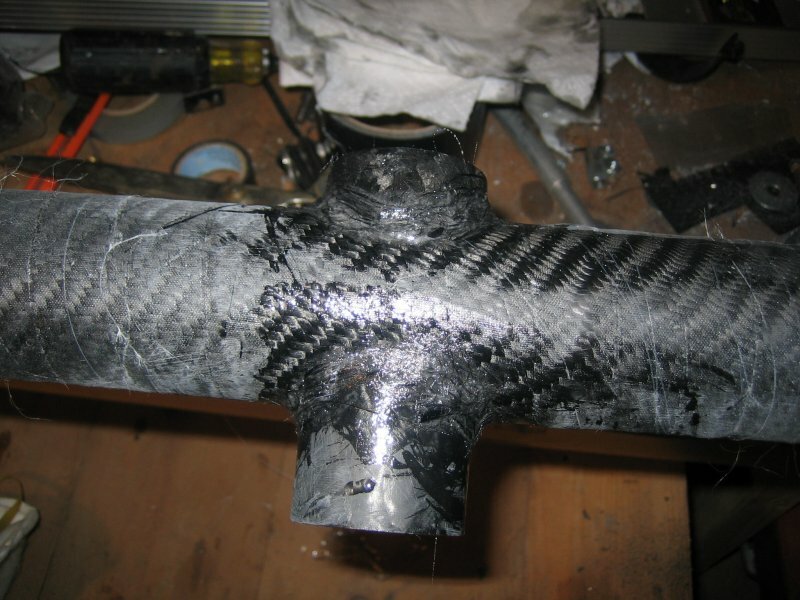 I had problems with the hacked inner tube bladder leaking during the last two pressure tests. Hopefully 3rd time is the charm. To ensure the bladder could expand properly, I cut the CF into 4 sections. I also cut the plastic wrap which protected the bladder into many sections to allow expansion. I had ordered two CF tubes from Hong Kong for the seat stays. They were advertised on EBay as wing spars for a model airplane. I thought they were big enough diameter to be used for seat stays but I did not convert the metric diameter to English properly because they were too thin. I think they may work nicely as cable guides/stops. Fortunately I was dragged to several thrift stores, one of which had some golf clubs with CF shafts. I picked up two of them as they were only $1.30 each, such a deal. After hacking them up, it looks like they will make great seat stays. After removing the peel ply tape, I cut the holes for the head tube and BB with my hole cutter. Well, it wasn't quite that simple. First I measured everything a couple times, then I checked to be sure things were square and level a couple times, then once again before cutting the holes. Don't worry about how this looks now, I will need to cut some of this off and add more CF to make the front of the main tube strong and pretty and aero. Using a bubble level works great, as you can measure in multiple paces and gravity always points straight down! I test fit the head tube and BB in the frame and put the frame in my jig. Looks straight, just like a stick! 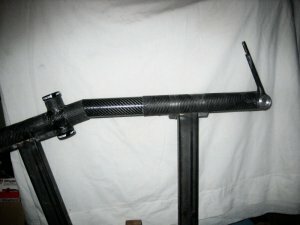 Also I laid up a CF tube over a waxed aluminum tube, which will be used over the steerer tube to attach the handlebars. 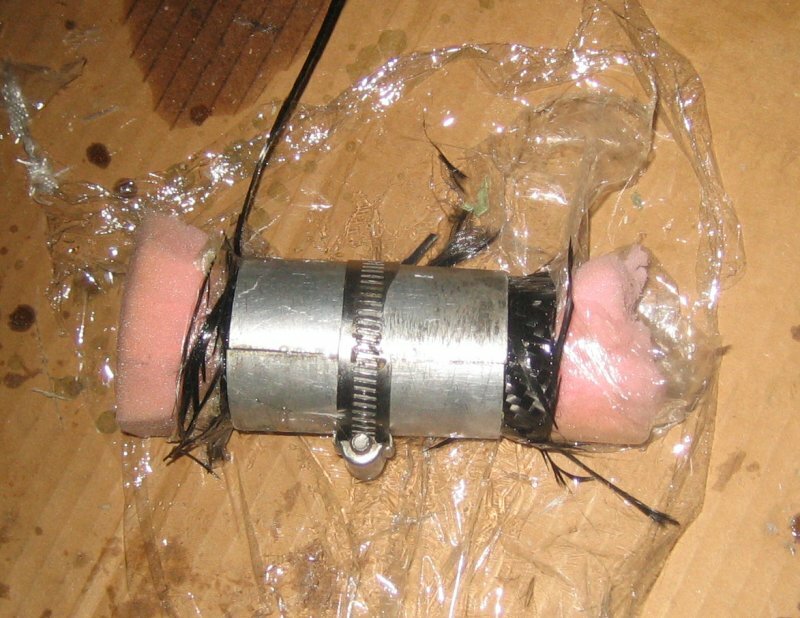 I sure hope that the "freeze the cured part and the aluminum tube pops out" trick works. I have been scared to try it in the past. 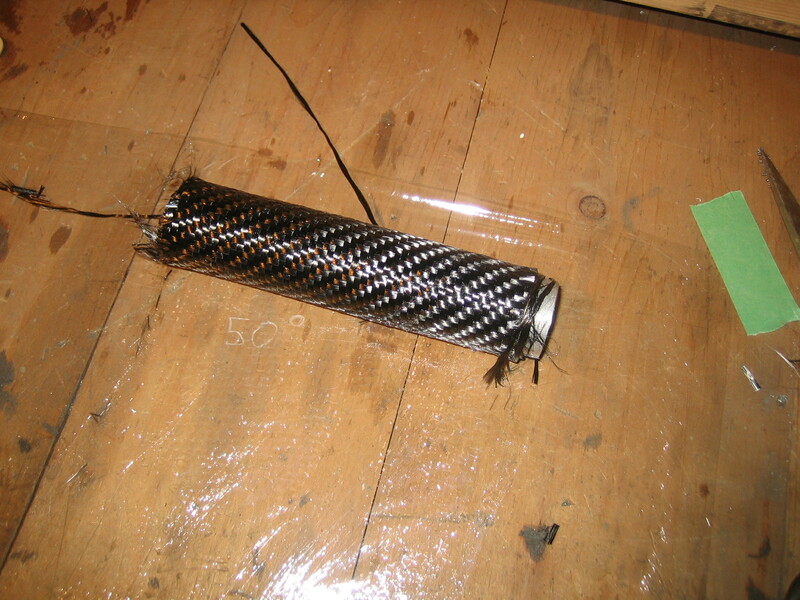 The picture shows the wetted out CF rolled over the tube before I wrapped it in peel ply tape. I chopped some leftover CF into small bits and mixed it with some CF to fill in around the head tube and BB. I'll sand it and cover it with a couple layers of CF later to strengthen it and make it pretty. The frame weighs now weighs about 3 lbs. There are a huge number of little brackets and things still to make. I am trying to make as much out of CF as possible. I have been buying parts and am trying to find ones that are light, but not too expensive. There seems to be a sweet spot for parts that are lighter than average, but not much more expensive than average. It will be interesting to see what this weighs when I'm done. 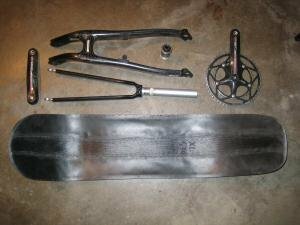 I pressed in the headset cups with my trusty vice, using some old gloves for padding, and added the fork and wheels. The cranks are just sort of hanging there in this photo. After eyeballing it from several angles, everything looks straight and true, yay! After removing the peel ply tape, I took the CF covered aluminum tube outside and packed it with some scientifically calibrated low temperature material. Common name "snow". I heard some pops and clicks as the tube separated from the CF. 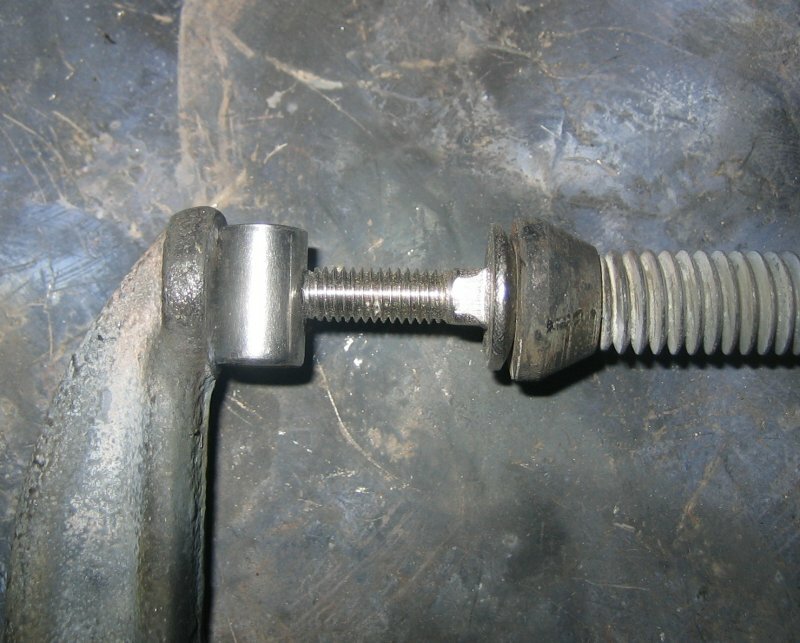 At 30 degrees F, the tube didn't just fall right out, I had to persuade it with a rusty bolt of the correct diameter. I was however able to remove it without any cursing or ritual bloodletting. 12/15/09 - I layed up two CF parts to be used to mount the seat base. 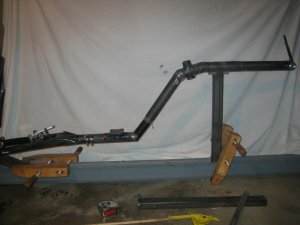 Last week I bonded the two seat base bracket parts together with lightweight filler. This week I reinforced the connection between the parts with several layers of CF. The bracket will be clamped to the boom with some hose clamps. Yeah sorry, going low tech there. 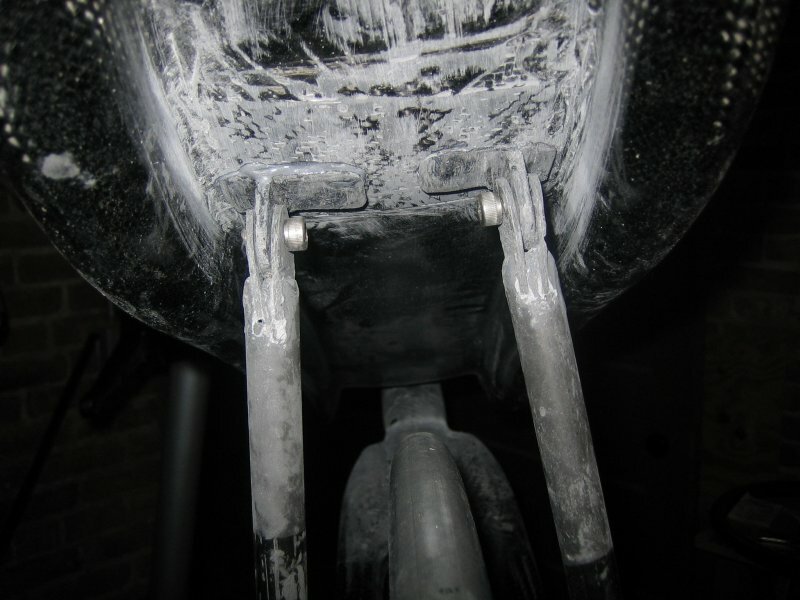 The seat will be bolted to the bracket to allow some minor adjustment. Next I have to make the rear seat stay brackets. 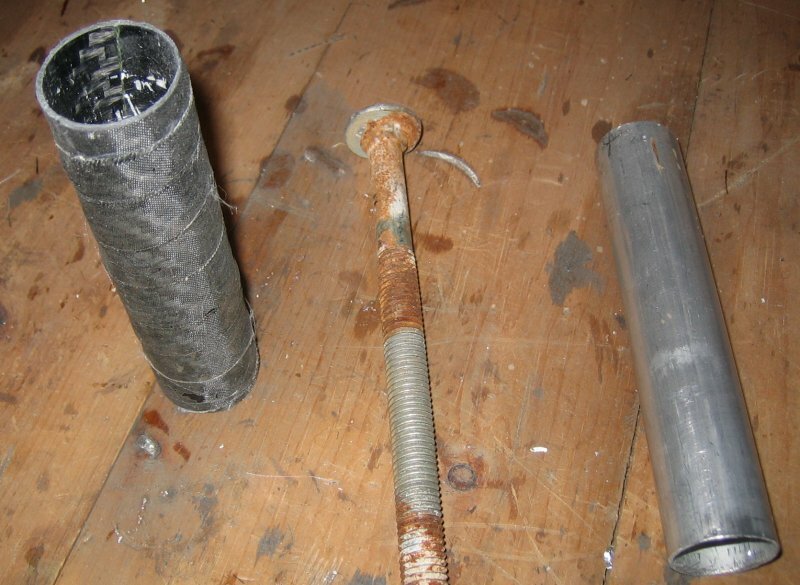 They will be held on with titanium bolts. Here are the top seat stay brackets. It's all held together with JB Weld for now so I can confirm that it's straight. I'll cover all the brackets with another layer of CF to strengthen them and make it prettier, then do a bunch more sanding to blend it all together. It's hard to make small CF parts, but they are nice and light. 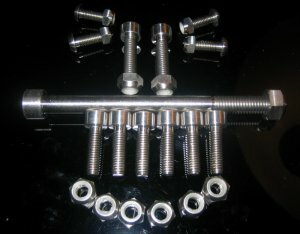 These 5mm, 6mm, and 8mm bolts will attach the seat, clamp the handlebars to the steerer tube, and skewer the main tube to the idler. Here are the upper seat stays after adding some CF to strengthen them. Gee looks kind of like the picture above, huh. Don't worry, it will look pretty after I sand it and cover it with a coat of epoxy. You can see the cool Paul Moto-Lite brakes in the background. These allowed me to use the 26" wheel canti-studs with the 700C wheel. Another exciting bike building picture. I epoxied the CF tabs to the CF golf club shafts and then clamped then to the rear seat stays. After they cured, I cover the mess with more CF to strengthen them. The seat is now fully mounted and seems sturdy. 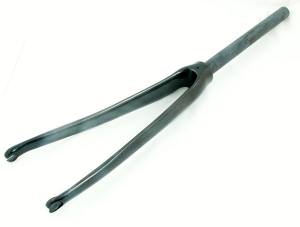 I'm ordering some titanium hose clamps from McMaster Carr to replace these steel ones. 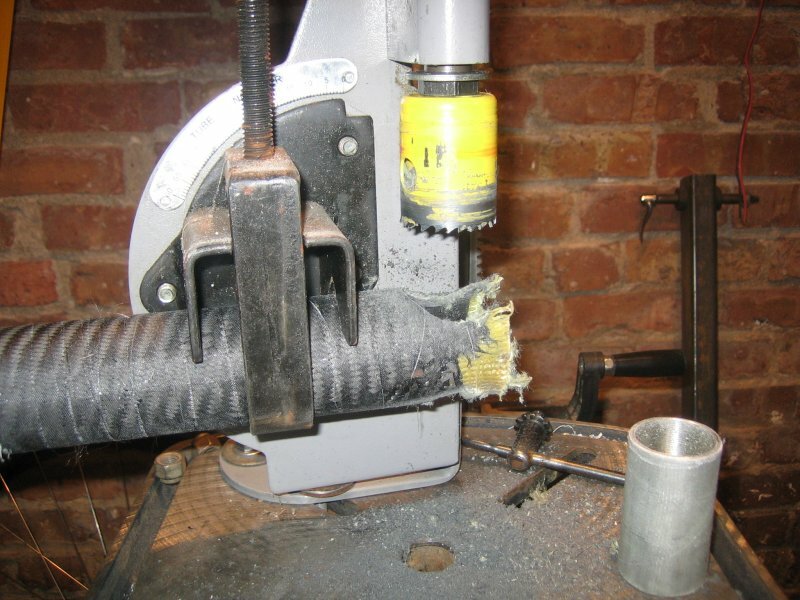 This picture shows the bike clamped to the bench press to drill the hole for the idler. 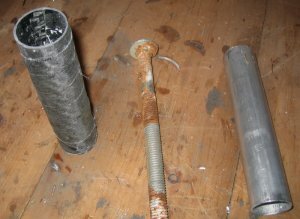 CF tubes are never the right diameter, so you have to make some yourself. Today I made a tube to mount the idler bolt, and another that will allow me to use bar-end shifters. I also mounted the handlebar stem to the headtube clamp tube. Handlebars can't be far off! This weekend was 'Winter Bike', a big swap meet where all the Chicago area bike stores try to sell off their used or unwanted parts and bikes. I picked up a nice light Bontrager front brake and a bunch of other parts. Cool! I weighed the bike with wheels, seat, brakes, BB, cranks, derailleurs, chain, idler and anything else I could find piled on top , and it weighed 18 lbs. Excellent. The only significant items I didn't weigh were cables and seat pad, so there is still a chance that this thing will weigh in at under 20 lbs when it's done! The Bacchetta Cabon Aero II weighs 21lbs 6oz, so I now have a benchmark to try to beat! 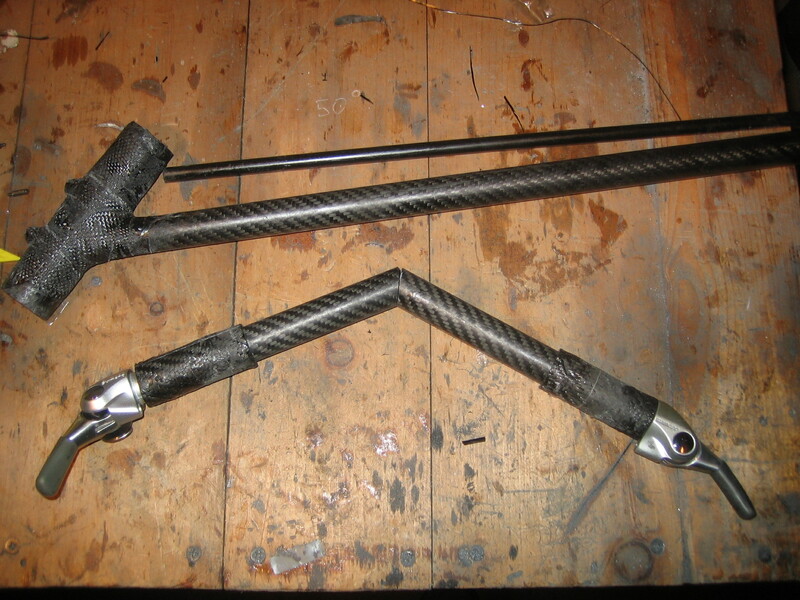 Here are the handlebars ready to be glued together. The bar-end shifter mounting tubes turned out great. The long tiller is a bit flexy, so as seen above, I'm thinking about adding a thin CF tube to reinforce it. I had my LBS run a tap through the aluminum BB shell, but it's still very tight. I hope the BB does not get stuck. I CF'ed in the idler bolt tube and mounted the huge Terracycle idler. 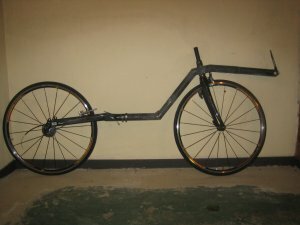 Here's the stick bike with the drivetrain more or less completed, and the tiller handlebar stem. 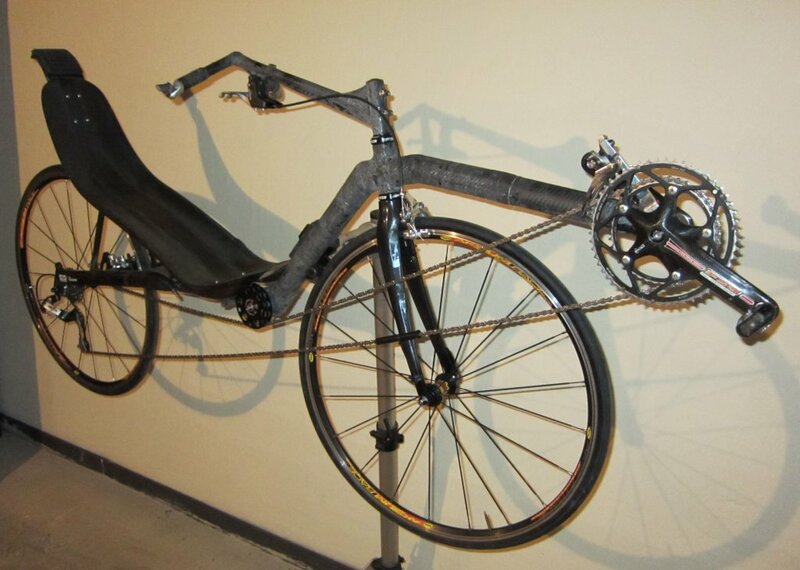 This bike should have an extremely efficient drivetrain. I attached the handlebars to the stem. Here I am in "the position". The bike doesn't look so big with me on it. No custom bike build is complete without problems. 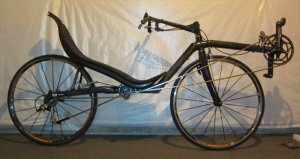 Problem 1 - Recumbent bikes have a front brake problem because the front brake cable interferes with the frame tube when you turn the wheel to the left. The solution? Make the cable exit the bottom of the brake. 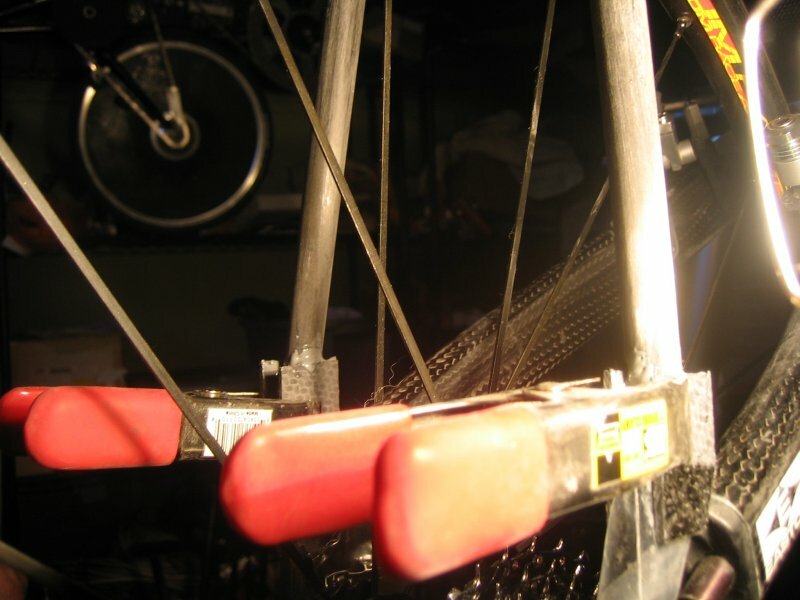 Here I'm jigging up a cable braze-on abd a bolt that crews in where the brake's cable clamp would normally be. Here's the brake with the new cable stop installed, and the cable clamped on top. 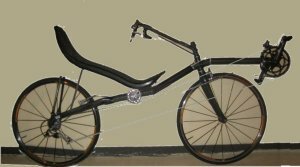 Problem 2 - I'm using a road brake in front and the brake in back has road brake cable travel as well, so I can't use the Paul brake levers. I'll go get some cheap Performance levers with adjustable cable pull and cut them up for the center mounted aero brakes. Problem 3 - I can only thread the rear derailleur cable from the back of the bike, so I need a fancy Rohloff cable joiner. 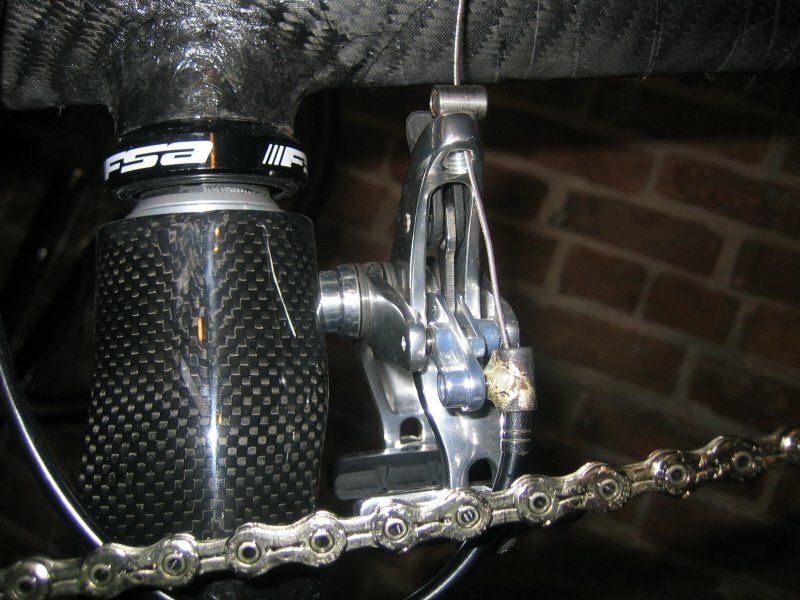 Problem 4 - I'm using a SRAM ESP 9.0 rear derailleur, and Shimano bar end shifter, which are not exactly compatible. The Shimano shifter pulls enough cable to get through 6 or 7 of the 9 gears. Current plan is to file enough off the shifter body to allow the shift lever to move far enough to access those extra gear. 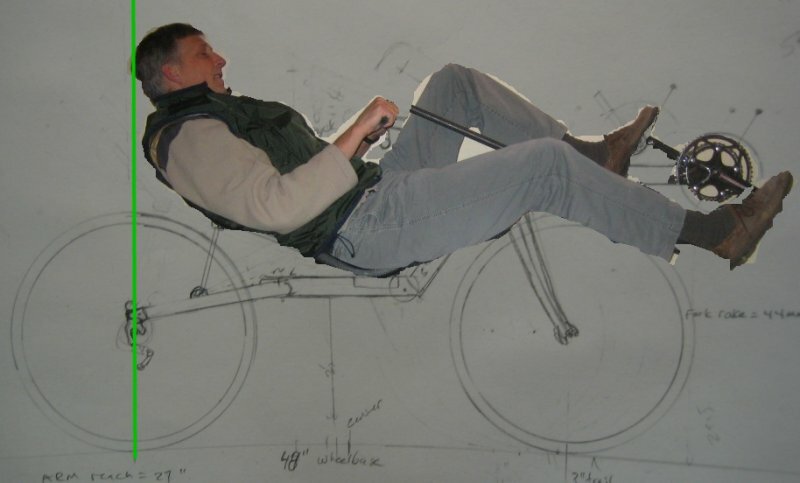 It seems like I'm constantly cutting up perfectly good bike components to make them work with recumbent bikes. 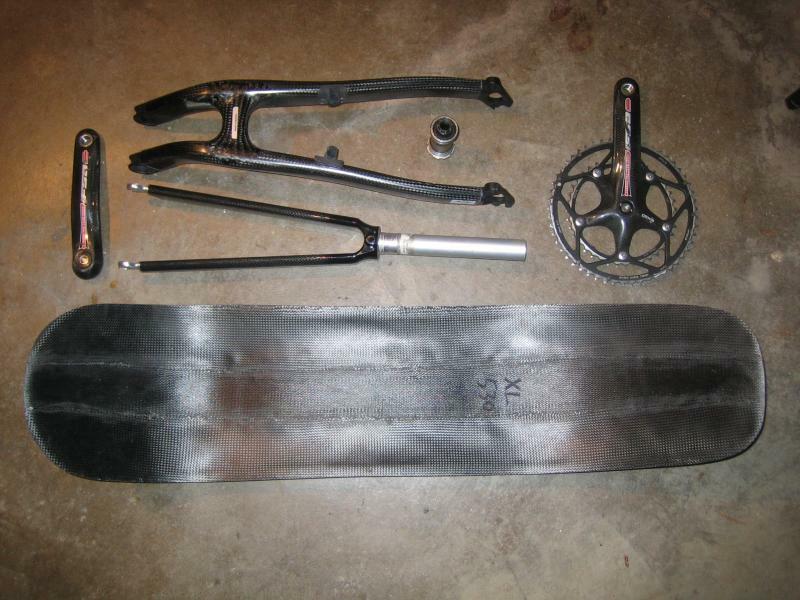 I have several sets of cranks and a set of pedals with bits cut off to provide streamliner clearance. I have a couple sets of brakes I cut up that are not much use now. I have cut up a bunch of brake levers to make them aero, or make them fit tubes they weren't designed for. The stick bike was designed to be as close to the NoCom position as possible so that I'm using the same muscles on both bikes. 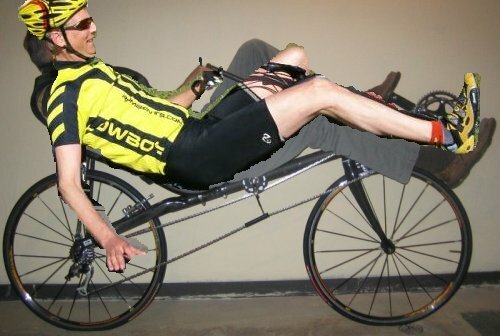 Here's Warren on the NoCom hacked out of a NoCom picture and pasted onto the stickbike picture. Are the positions the same? Pretty close. The seat and handlebar are the same, but the stickbike's BB is about an inch higher. I made good progress over the past couple weekends. I cut up and mounted the Forte levers, and they have the right amount of pull. I also added a bunch of cable stops. You can see here that I ran the bare cables right out of the brake levers, to cable stops on the stem. 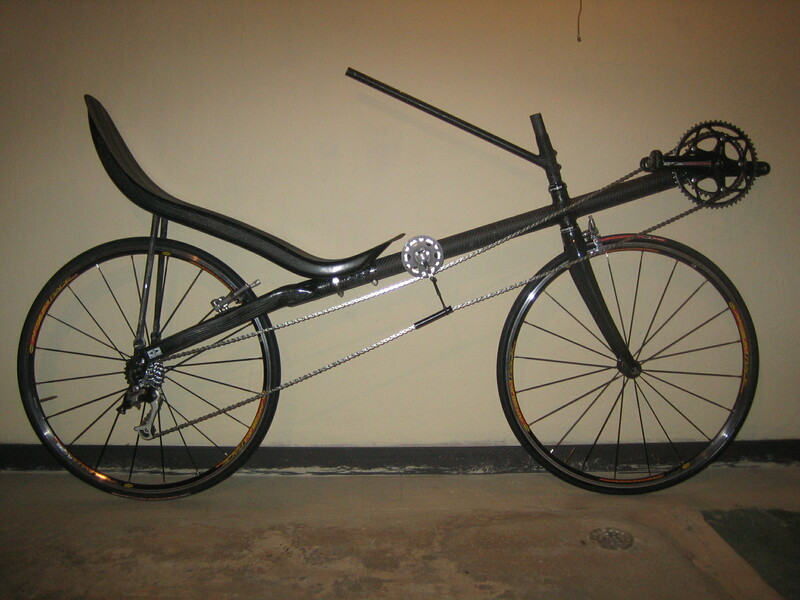 Here's the bike with the completed handlebars. I have since moved the chain tube chunk to the front fork, where it can float up and down, but will protect the fork and still reduce chain flop. To make the cable stops first I cut a chunk of CF tube about 3/4" long. This is tubing I bought via e-bay that I thought would be useable for chain stays but was way too thin for that. It's the perfect ID for sliding in a cable end though, or using for a cable housing guide. Next, I rough up a cable end with some 100 grit sandpaper. This increases the surface area and gives the bond more surface area to stick to . Then I cover the cable end in JB weld and slide it in. 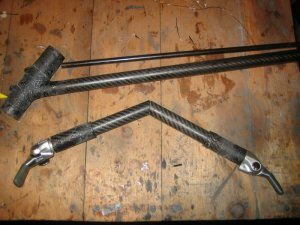 Here are two types of cable stops. On the bottom is the CF cable stop as explained above. On top of the tube I bonded some cable ends directly to the tube. To fasten the cable stops, first I glue them down with some JB weld, then after that cures I add chopped carbon over the top and to fill in the sides. Here's the front brake with the cable routed. After I add another layer of CF around the head tube, I'll bond on a short chunk of CF tubing to guide the cable going to the front brake. I received the Rolhoff cable connector from Hans of Elan. Not cheap but they do the job, fixing issue #3. 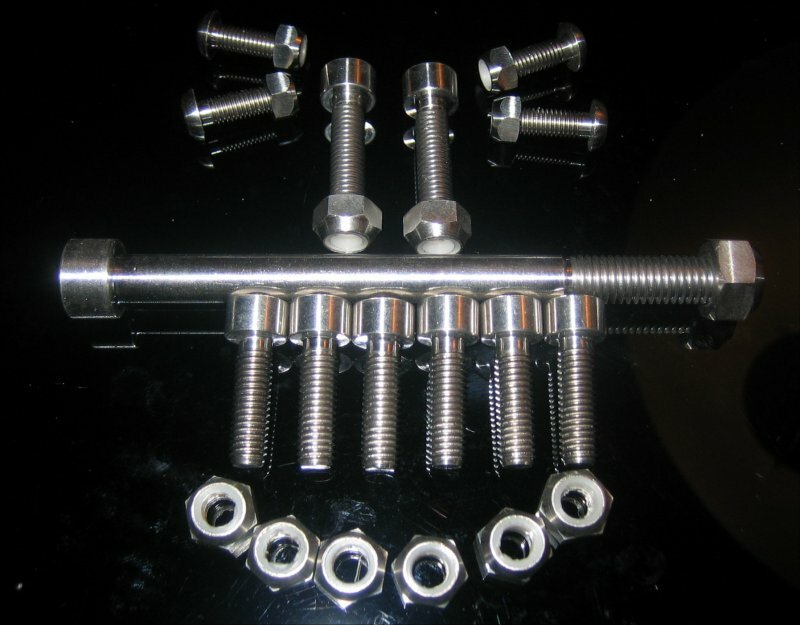 Also here you can see the titanium hose clamps. Here's a close up of the hacked up up forte brakes. Also you can see the derailleur cables on top of the tube. Time to make the seat pad. I bought a bunch of Zote foam from Garrie a couple months ago. It is very lightweight and a has the right give for seat foam. I really like the seat pads Don Smith makes with the routed lines, so I decided to make something similar. I decided on curved ribs to allow the sweat to drip out. I taped the foam to the board to prevent it from sliding around. Using a 700C wheel for a router guide, and following lines marked every 1" on the board under the foam, I carefully routed the ribs. You need to go back and forth once with the router to remove the fuzz. Here's the completed seat pad. I touched up the edges with a belt sander, which is not quite as nice as one of Don's pad's but still looks fine. 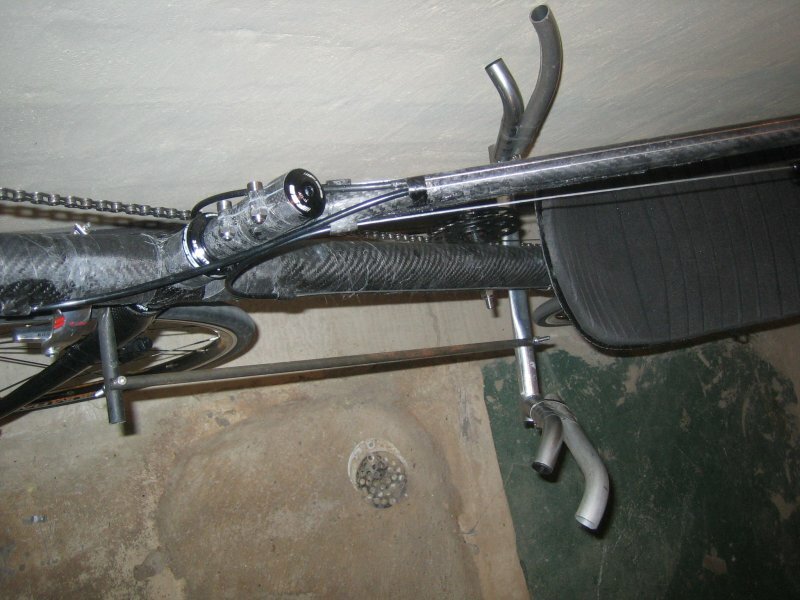 Here's the cockpit view of the handlebars. Here's the modified Shimano shifter. You can see where I filed on it. 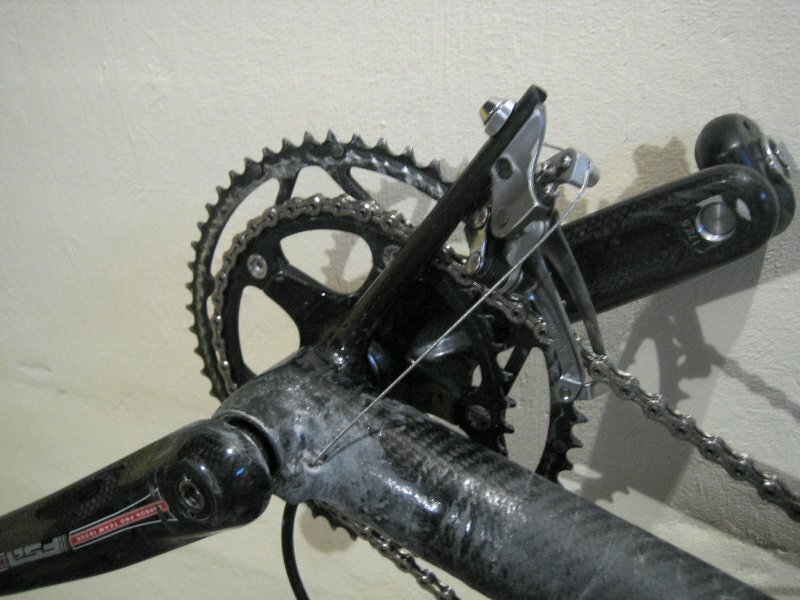 Yes, it does (barely) shift the SRAM 9 speed rear derailleur through all the gears. 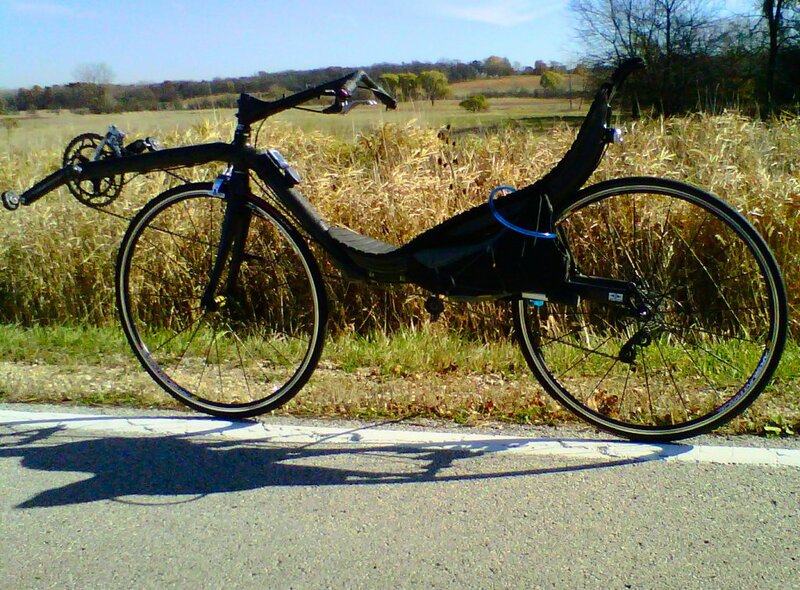 The juxtaposition of nice weather, dry roads and a rideable stickbike occurred today. After a shaky start, I took it on the 5 mile test loop, and it actually felt pretty good. + cockpit position feels right and is comfy. 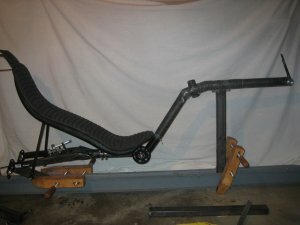 + seat and frame seem solid when cranking on it. - dang that tiller boom is long. It may take some getting used to. - handlebars do not feel solid. - needs a head rest. - can't tell if it's the tiller or some kind of torsional frame twisting, but at low speeds some funny corrective actions were required to keep myself going straight. Overall though, a good first ride! Now I need to install the front shifter tube and maybe reinforce the handlebar tiller. After much mucking about trying to get the angle right and figuring out the right combination of wires and tape to hold the derailleur stem in place while the epoxy cured, the derailleur tube is in place. 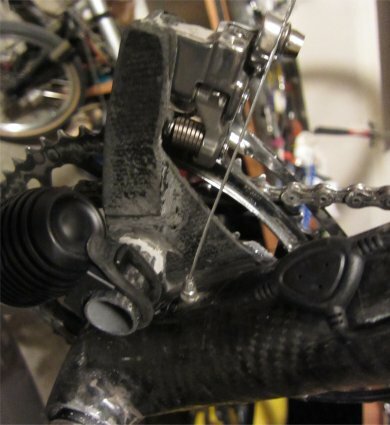 I used another chunk of the CF golf club stem, with a braze on type derailleur. I also added another cable stop to the side of the main tube, behind the BB. Shifting is good. The CF headrest that Garrie Hill made for my ti-cuda project many years ago was resurrected and works great for this bike. I made an attempt at reinforcing the handlebar, but it did not work out so I removed it. Total weight is now a hair under 20 lbs with the heavy pedals and all the components, seat pads, etc. I have had several rides on the bike now, and it seems fast but is still takes too much concentration. to ride comfortably. Also, it seems really high to me. So, how do I fix it? Remote Steering? 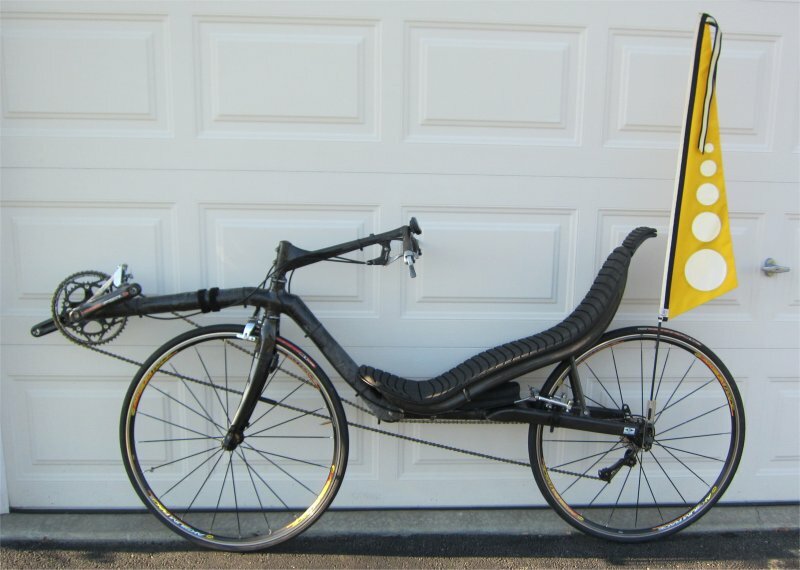 It would work, but it would look really funky on this bike. 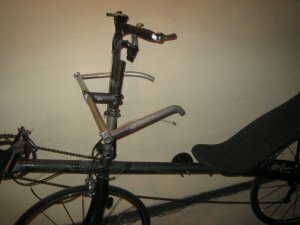 Underseat steering? 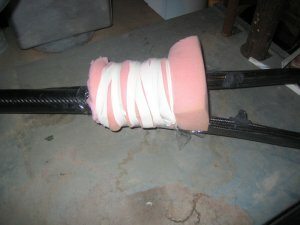 I rigged up a test to see if it felt any better than the tiller. Nope! It was worse! 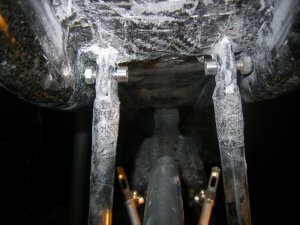 After some back and forth posting on the recumbents forum, the consensus was that the handling issue was caused by too much weight on the rear wheel. 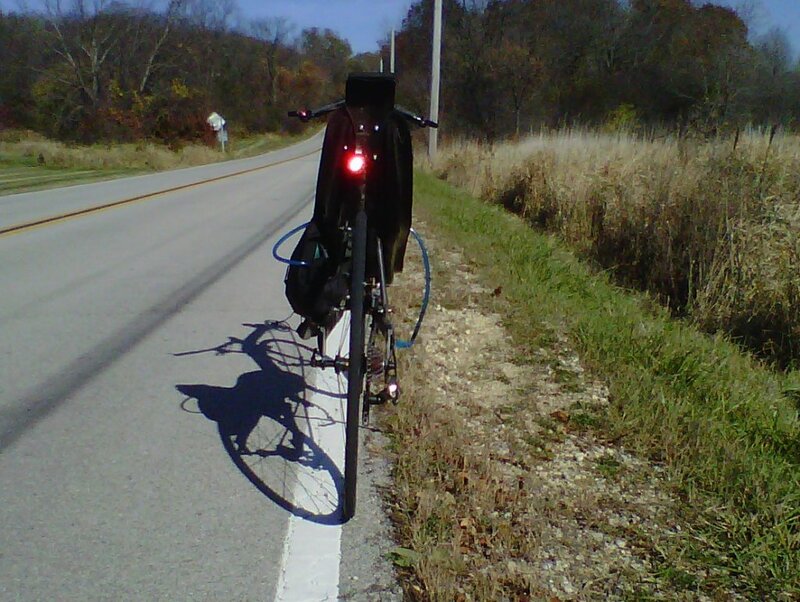 Looking at my bike from that aspect, I can see that I have over 70% of the weight on the rear wheel. Ideally the weight distribution would be 50/50. 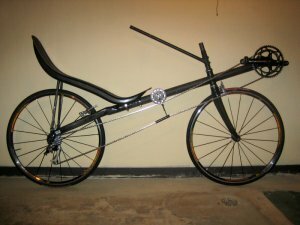 That would not be so bad, but my seat is laid way back and I have a long tiller, both of which make it harder to control the bike. 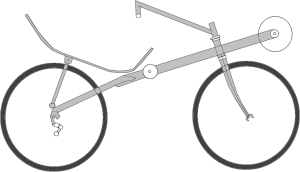 Wider handlebars like those used by Bacchetta and others help to compensate for the rear biased weight distribution common on stick bike (high racer) designs. I'll try that before hacking this bike up. If that doesn't work, I'll need to make a bunch of compromises which will make it heavier, and make the boom longer (more flexy!). It will look cooler though. Here's a mockup. I cobbled together some superman bars for the stickbike and gave it the "can I ride across the basement" test. Yes I can. 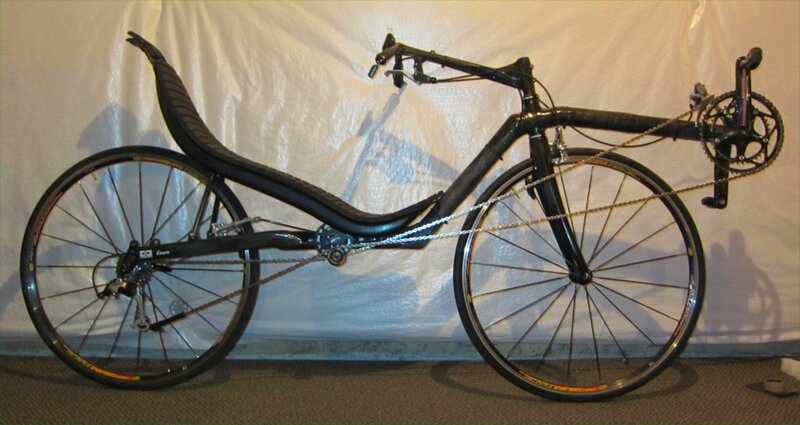 It seems the the wide bars on highracers make up for the less than ideal handling inherent in that design. This gives me hope that I may not have to hack the bike up. I think I'm going to go forward with adding the superman bars for now so I can actually ride the bike while there is summer left, then maybe this winter I will hack it up to make it more of a Euro high racer. 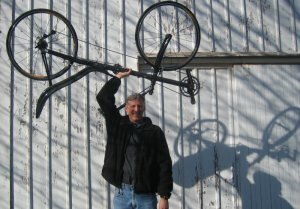 I ordered a set of Bacchetta long-reach superman bars and tried them out on the bike. I could not reach them. I added 8" extenders and then I could reach them, but the bars were too long and hit my thighs. I give up. 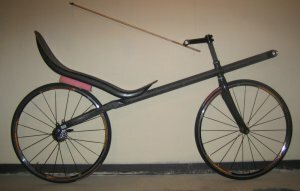 The stickbike type of bike won't work for me with a laid back seat. Back to the drawing board. Steve Delaire noted a basic recumbent bike design rule that I am violating. This is that your head should be forward of the tire contact patch. 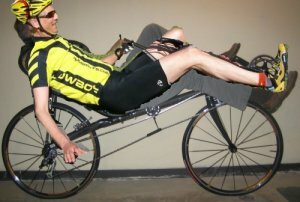 Having your head forward of the rear wheel is especially important when you are laid back like I am. This is probably why the bike feels squirrely. The only way to fix this is to lengthen the boom a bunch and push myself way forward. This will also get me closer to the steerer tube so my reach to the handlebars is not as extreme. Here I am racing Dennis Grelk's Bacchetta last fall during the Hawkeye Downs HPRA races. We had to push the seat way back which made it more upright, but I still had a tough time reaching the bars. It's unfortunate that this design does not work well for taller riders, but that's what hack saws are for! 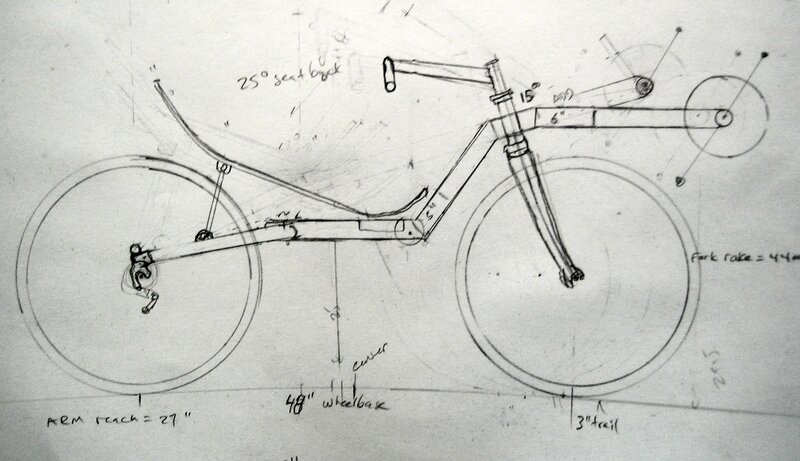 I spent a couple hours drawing the revised design, then hacked the boom off my stickbike. Here's the revised drawing. It shows that I need to add 6 inches to the boom, and tilt it down 15 degrees. After doing that, I need to Z the frame to keep the same 8" height distance from seat bottom to BB. Oooh. Seat height is reduced from 24" to a comfortable 19", CG is close to 50/50, Tiller is short. To ensure a good mechanical connection between the old a new boom sections, I needed to make a sleeve. 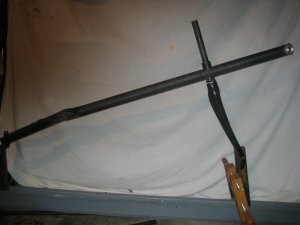 I made a sleeve mold from a chunk of aluminum tubing, and used some foam to press the CF into the sides of the tube. This is the boom with the sleeve holding the old section to the 6" extension. 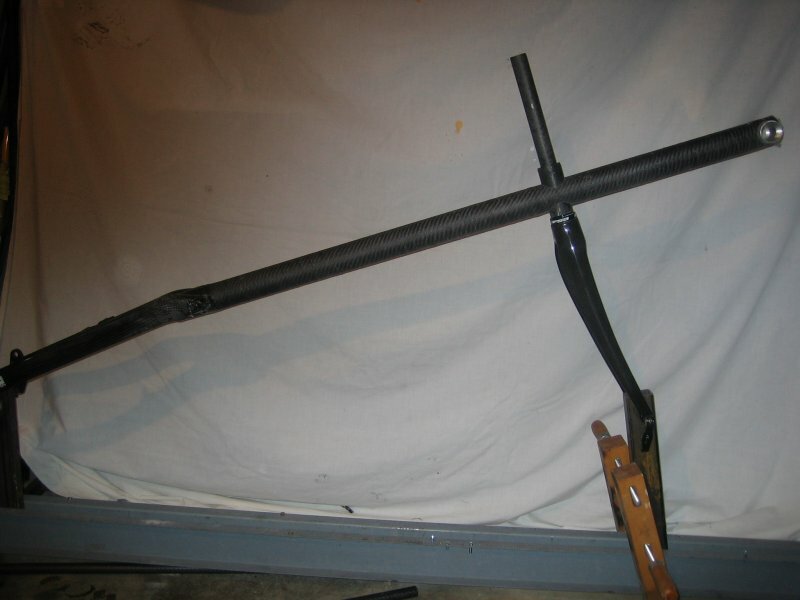 To attach the 6" extension to the main frame, I will need to use an inner-tube to bladder mold a few layers of CF to the inside of the tube at the 15 degree bend. 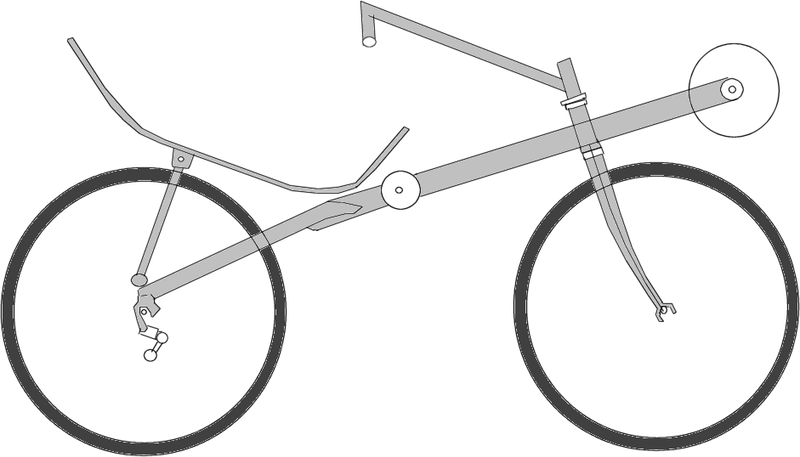 I cut and pasted myself onto the revised drawing to make sure the riding position is the same and that my head is forward of the rear tire patch. Yes! Checked with the seat and idler to ensure the fit. I will need to revise the seat stays. I put the wheels on to check the angles. I put a single layer of CF on the top joint to hold it together while I add the Kevlar sleeve to the added section. The white bandages are peel ply tape that I use to mash all the layers together. Any excess epoxy weeps through the fabric weave. The epoxy doesn't stick to the peel ply tape so it can be removed after it all cures. Time goes by and I have Kevlar and CF wrapped the rest of the joints. Sorry no pictures, they would just be of more black tubes wrapping in bandages. 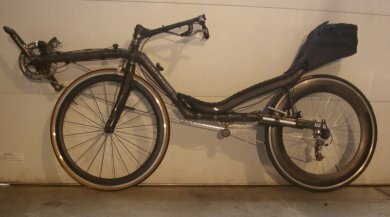 Next I will need to add new seat stay mounts to the rear stays, re-route the brake and shifter cables, and then start re-adding the parts. I peeled off all the peel ply, put the wheels back on and did the bounce test. 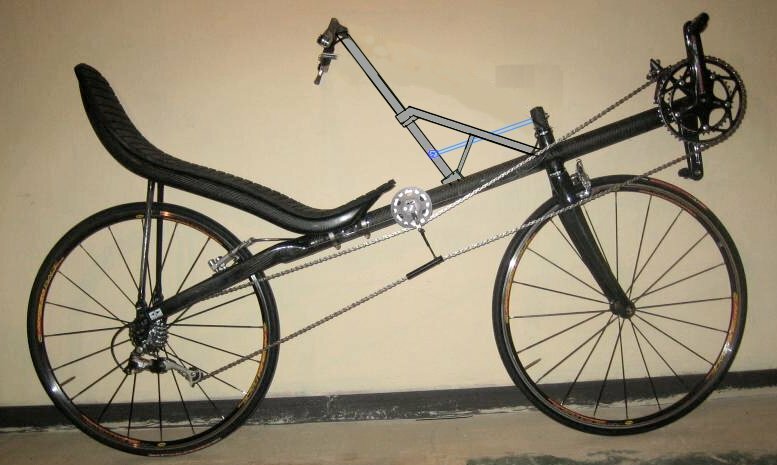 Not bad, it's as least as stiff as it was in stick bike format. Made some CF seat stay tabs using CF plate I got from Mark Anderson. Very stiff!. Hacked 6" off the old seat stays and JB welded the assembly in place in preparation for actual bonding. Hacked over a foot off the tiller handlebars and JB welded into (hopefully) the right position. The bike looks nice, like a lowracer with an impossible large front wheel. Here's the bike after copious generation of carbon dust, and partial assembly. The test ride across the basement went well, the bike now handles fine. 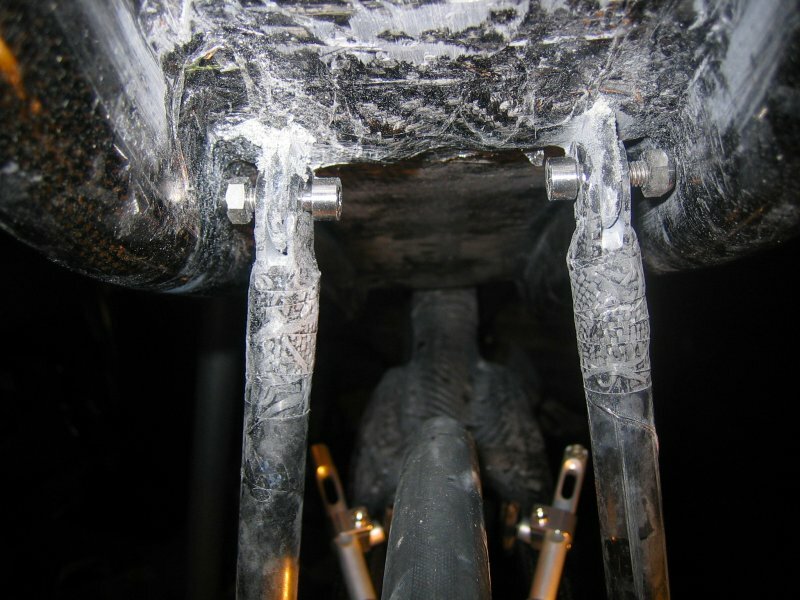 Due to lots of reinforcement, The bike is stiffer now than when it was a stick bike. Weight with everything but the brake housings is still only 20 lbs. Cool! Next I have to re-run the brake and shifter lines. 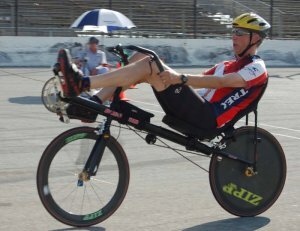 I raced this bike (without the flag) at the Iowa HPRA races in September. Average speed for the hour race was 23 MPH, which is about 2 MPH slower than the NoCom, but 3 MPH faster than the Bacchetta ti-Aero I raced there last year. It handles nicely at speed, but due to the lower chain's interference with the front wheel, it does not go around corners well at low speeds. Also the frame is a bit flexy, which is good for bumps, but bad for power transfer. I still have some more tweaks to do, but it's a decent ride. I decided I needed to actually see where the flex was occurring, to see if I could fix it easily. If it's in the joints I can cut a slot lengthwise through the joint and then bond in a carbon plate. Click here for the full size video. I'm also going to use an idler to raise the non-power side chain, as it restricts the wheel movement too much in the "down" position. I moved the idler behind the seat in hopes that it would help the frame flex. Cranking on it, it does seem to flex less. In conversations with Larry Lem, he notes that his fastest TT times were on his dual 650C highracer with dual disk wheels. I will try this bike with dual disk wheels next year and see how it fares. I have been riding this bike weekly all year, and really like it. 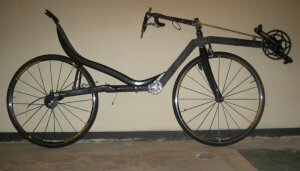 It handles well, goes up hills easily because it is so lightweight, and seems fast. It's certainly not as fast as the Nocom, but is much more civilized. Here's the rear view. I ride with that light day or night. It is very bright and can be seen for miles, even in the day. It's a magic shine tail light. The BB mount aluminum front derailleur post finally cracked enough times that it was not worth epoxying together again, so I made a derailleur mount out of CF plate. It took several days of tweaking but it seems solid now and the alignment is close enough so that it works well. I need to reinforce some of parts I attached with JB Weld with some real epoxy and CF, but it seems to be strong enough for a test ride now. I also added short CF tubing stub to mount the headlight to. The CF plate is pop riveted to the boom tube and epoxied. 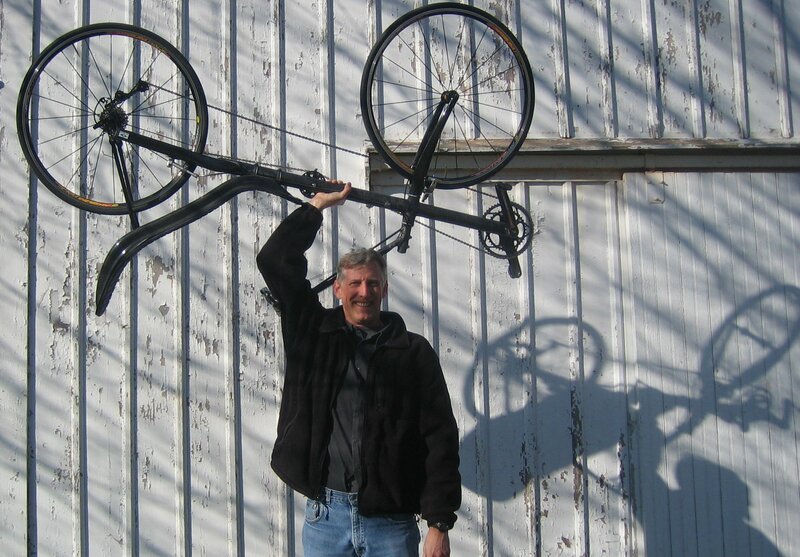 I'm getting the bike ready for the 2013 riding season. I added a Bacchetta Brain Box bike bag to the back of the seat to replace the water bladder bag hanging on the side of the seat which was probably less than aero. Also I obtained a used rear CF aero wheel, with power tap hub. I looked on Ebay for a front CF wheel to match the rear for a couple months and finally got disgusted and bought a new wheel direct from China. Update - I have been riding this bike at least weekly (except in the winter!) for almost 5 years. It has been holding up well. Occasionally I sand the CF tubes and add another layer of epoxy as they are still a little rough but it's not very noticeable. It had been very reliable until yesterday when the front derailleur mount failed due to a JB weld failure. Today I re-glued it and reinforced it a bit with some chopped CF. Also I have to buy a new front tire. The old one has a bulge in the sidewall due to getting worn through by contact with the chain, which rubs when I turn sharply..